*.All.sln contains both mobile and web development projects. Core.Shared project contains consts, enums and helper classes used both in mobile & web projects. Core project contains domain layer classes (like entities and domain services). Application.Shared project contains application service interfaces and DTOs. Application project contains application logic (like application services). EntityFrameworkCore project contains your DbContext, repository implementations, database migrations and other Entity Framework Core specific concepts. 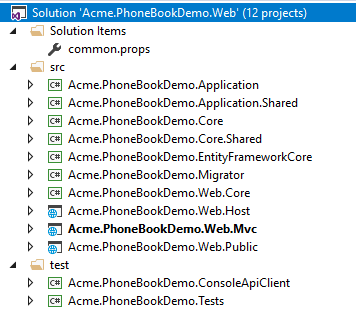 Web.Core project contains common classes used by MVC and Host projects. Web.Public project is a separated web application that can be used to create a public web site or a landing page for your application. For more information see Public Website. ConsoleApiClient project is a simple console application for performing API requests to the application authenticated via IdentityServer4. Tests project contains unit and integration tests. Back End API (Web.Host): An application to only serve the main application as REST API and does not provide any UI. Public Web Site (Web.Public): This can be used to create a public web site or a landing page for your application. Migration Executer (Migrator): Console application that runs database migrations. It's used to calculate some URLs in the application. So, you need to change this on production. Multi-tenancy is used to build SaaS (Software as a Service) applications easily. With this technique, we can deploy single application to serve to multiple customers. Each Tenant will have it's own roles, users, settings and other data. ASP.NET Zero's code-base is developed to be multi-tenant. But, it can be disabled with a single line of configuration if you are developing a single-tenant application. When you disable it, all multi-tenancy stuff will be hidden. If multi-tenancy is disabled, there will be a single tenant named Default. Host: Manages tenants and the system. Tenant: Uses the actual application features and pays for it. You should configure DNS to redirect all subdomains to a static IP address. To declare 'all subdomains', you can use a wildcard e.g. *.mydomain.com. You should configure IIS to bind this static IP to your application. Check out the multi tenant documentation if you are building multi-tenant applications. Similar to WebSiteRootAddress, ServerRootAddress setting is also exists in appsettings.json in .Web.Host project. In addition, .Web.Host application contains ClientRootAddress which is used if this API is used by the Angular UI. If you are not using Angular UI, you can ignore it. CorsOrigins setting is used to allow some domains for cross origin requests. This is also useful when you are hosting your Angular UI in a separated server/domain.